2000 – 2019: Ongoing investigation into Aerojet Chino Hills facility began when Collins found a contaminated 800-acre complex that operated for nearly 40 years. Unexploded bombs, depleted uranium, heavy metals and chemicals polluted the property. Cleanup activities began in earnest after exposé, costing $46 million so far. 2002 – 2019: Collins broke story that radiological and chemical pollutants may have migrated from neighboring Rocketdyne onto ranch. Reporting stopped development which led to the creation of a 2,900-acre expanse of public park land in 2003. In 2013 and 2015, more radiation and chemical contamination were found at the ranch linked to Rocketdyne. 2008 – 2019: Corporate Pointe site once occupied by Hughes Missile Group, Rocketdyne, Atomics International and Raytheon Missile Systems. Heavy metal, chemical and radiological contamination. In August 2009, L.A. okays development of property without Environmental Impact Report and eases environmental standards through rezoning. 2011 – 2019: Over 8,383 radiation tests from over a dozen states and Australia from March 11, 2011 to March 11, 2016 and counting. Posts, graphs, live streaming radiation monitoring, EPA RadNet monitoring, Radiation Food Lab and video. Investigation uncovers mechanisms and routes of Fukushima fallout worldwide. 1998 – 2019: Ongoing investigation of the Santa Susana Field Lab between the Simi and San Fernando valleys, site of a partial nuclear meltdown in 1959 and massive chemical contamination from thousands of rocket tests. Exposed government and polluter collusion undermining agreements using “greenwashing” techniques on the media and public as well as use of an “astroturf” group of collaborators against Rocketdyne cleanup. 2004 – 2019: Like Ahmanson Ranch, Runkle Canyon abuts Rocketdyne. And also like the ranch, this property slated for residential development with 461 homes, seems to be polluted by Rocketdyne’s contaminants. More radiation contamination found in 2013 linked to the Santa Susana Field Laboratory. 2006 – 2019: Investigation prompts $2 million toxins testing promised in 2007 at same time Bush Administration abandoned $4 billion plans for VA development, admitting dump revelations helped derail scheme. Tests confirm dump and show expanded contamination at the VA.
1996 – 2019: Nuke plant vulnerabilities, illegal dumping, nuclear infrastructure threats, fireworks pollution, offbeat adventures and more. March 11, 2011 through June 2, 2017 and counting: EnviroReporter.com has produced more than 9,249 special tests and original reports including 3,045 measurements and analyses from nine affiliated Radiation Stations and 6,204 samples and radiation experiments from Radiation Station Santa Monica California. EnviroReporter.com has over 2,200,724 readers and 1,580,275 viewers along with the 24,369 people who have seen Radiation Station Glendale California‘s continuous online streaming. Over 213,751 viewers have watched 101 original videos on our YouTube channel. Thanks to you, we’ve received 7,847 comments and tens of thousands of Facebook ‘likes’ for our site, investigations and Facebook channel. Thank you for your continuing interest and support. Fukushima – The Perfect Crime? 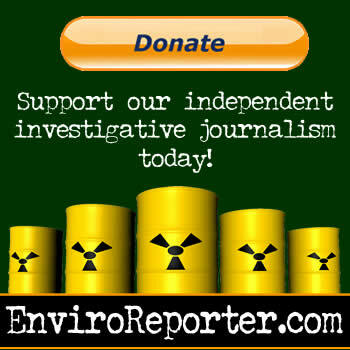 Make a donation to EnviroReporter.com to support our award-winning environmental investigative journalism. Got tips on EnviroReporter.com's investigations or other hot environmental news? Let us know!